Cartoon Network has been taking advantage of game tie-ins for their various animated series since the days when the commercials for said games included not only the web address but an AOL keyword. These games were hugely popular, since they were easy for kids to access, acceptable to even the most helicopter-ish of parents, and updated frequently with new types of games and games based on new series as they aired. You can even find many of the games from the early 2000’s still in working order on Cartoon Network’s website. Cartoon Network was also quick to begin working with various developers to create games based on their properties, starting with a PowerPuff Girls title for GameBoy Color in 2000. Many of these games were critically panned or given a mediocre rating at best. This began to change with the Adventure Time games starting in 2014, which received positive responses from fans and critics alike. 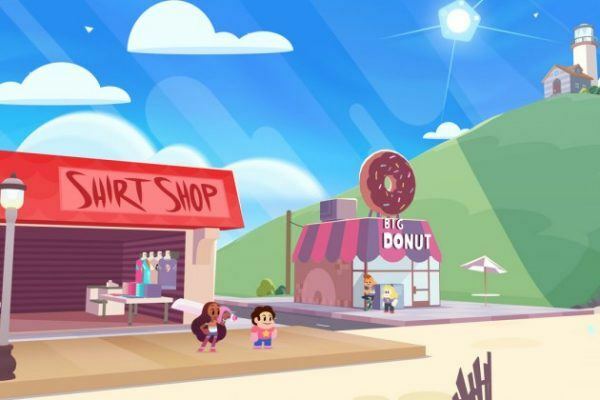 Likewise, in 2015, the Steven Universe mobile game Attack the Light received high ratings for faithfulness to the series, challenging gameplay, and the engaging storyline by show creator Rebecca Sugar. In this turn-based RPG, Garnet, Amethyst, and Pearl (and Steven!) battle monsters to recapture the creatures contained in an ancient gem weapon. Items like Cookie Cat ice cream bars, star shaped fruits, and the lucky birthday crown are stored in Steven’s Cheeseburger backpack and used during battle to give the gems a boost. Attack the Light was rated 9/10 by Destructoid and Game Skinny, and deemed “totally worth it” by Kotaku columnist Mike Fahey, so the announcement of the follow-up console game Save the Light will be welcome news. New features will include customizable battle parties and 3D explorable environments. Cartoon Network hosted a panel at PAX East last weekend with speakers from Attack the Light/Save the Light developer Grumpyface Studios and other indie developers they have been collaborating with for first looks at Save the Light and other titles. The topics discussed at this panel indicate that Cartoon Network will be looking to further facilitate the connections between show creators and indie developers in the future. Save the Light is expected to be released this summer.